and your basket will hold the past . . . This powerful picture book, with its rhythmic text and evocative paintings, spirals through time, becoming a triumphant song – a rich story of a craft, a culture, and a people. 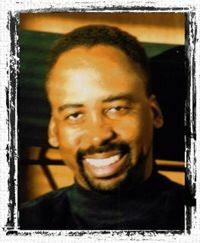 E. B. Lewis is the highly acclaimed illustrator of more than thirty picture books, including The Bat Boy and His Violin by Gavin Curtis and Virgie Goes to School with Us Boys, by Elizabeth Fitzgerald Howard, both Coretta Scott King Honor Books. E. B. Lewis shines his light to the world through his artwork. Raven’s lyrical prose resonates with such emotional connections, and traces the weaving skill as it passes from the Africans to the captives in America to today’s roadside craftsmen and women: “And when your fingers talk just right that circle will go out and out again-past slavery and freedom, old ways and new, and your basket will hold the past. A local chamber music program administrator and a noted children’s book author have combined to provide an opportunity for youngsters and their families to be introduced to classical music. Charleston House Concerts will present a string quartet in concert with a narrator and projected images in “Music and Stories That Pass Through Generations” at 3 p.m. Sunday at the Footlight Players Theater, 20 Queen St. Admission is $7 for adults and $5 for children. Sandra Nikolajevs, who directs Charleston House Concerts, and Margot Theis Raven, author of “Circle Unbroken,” got together after Nikolajevs approached Raven about doing a program for kids. The idea is to teach children about the different instruments of a string quartet, and how music and stories are passed through generations and make up the fabric of cultural history, Nikolajevs said. The concert will begin with an introduction of the musicians and their instruments. The string quartet will perform arrangements of such popular children’s songs as “Are You Sleeping?” and “Twinkle, Twinkle Little Star” with the audience singing along. The focal piece of the concert will be a performance of “Circle Unbroken: The Story of a Basket and Its People,” a musical adaptation of Raven’s children’s story that brings to life the history of sweetgrass basket making, an art form that was brought to the Lowcountry by Africans that has been passed on to their descendants. The string quartet will perform music of the late black composer William Grant Still as the story is narrated by local classical musician Rachel Dowling and illustrations by E.B. Lewis are displayed. She said her group wants to make the show something children will enjoy and that maintains their interest. As part of the Piccolo Spoleto Spotlight series at the New Tabernacle Fourth Baptist Church, Chamber Music Charleston introduced their spellbinding version of “Circle Unbroken,” arranged by bassoonist and manager Sandra Nikolajevs. It is based on Margot Raven’s story of the origin of the sweetgrass basket, the basket woven by local black artists who are the descendants of slaves. Nikolajevs also cobbled together the music from two string quartets by William Grant Still to provide a musical background to the words, narrated by Rachel Dowling, and with slide illustrations by E.B. Lewis. “Circle Unbroken,” the centerpiece of the concert, traces the literal and symbolic history of the sweetgrass basket from 18th century Africa to 21st century Charleston. The baskets were created by Africans and brought to southern America. After passing through plantation slavery and wars, the sweetgrass basket ultimately becomes a symbol of racial harmony in this piece. The general good humor of Still’s music softens the more gruesome aspects of the dialogue, making it more palatable to the intended audience. Both Still’s music and Lewis’ illustrations foreshadow the final happy racial resolution. Circle Unbroken is a semi-fictional story about a grandmother who tells her daughter how she has learned to weave sweetgrass baskets. She goes through their ancestors, the Gullah, from Africa and how their traditions carried the basket weaving through generations by testing girls and boys on their skill in order to rise up into adulthood. She goes on to tell how their family was captured and transported to the Carolinas to be sold as slaves. She tells of the Revolutionary War and of freedom won. She explains how the “beauty of old baskets was something new” as people stop by the small carts selling baskets to the tourists. Throughout the ages, the tradition of weaving the baskets has been passed down generation to generation linking the future to the past. This book takes an educational topic, the history of the African Gullah and the sweetgrass basket, and weaves the fictional story of a girl learning from her grandmother to create an entertaining and informative book for children. It certainly developed my own appreciation for a unique culture and its sweetgrass baskets. A book about the origins of the intricate technique and art of basket making as preserved by the Africans who were brought to America as slaves and their descendants. A grandmother guides her granddaughter’s hands as she teaches her the art of basket sewing. When the child asks her how she came to make baskets, the woman’s answer harkens back to a time when one of their ancestors, the child’s “old-timey grandfather,” is being initiated into manhood in a village in Africa. Part of the rite involves being able to make a grass basket woven or coiled so tightly that it can hold water. Soon after this event, the young man is captured, transported to America, and sold as a slave at an auction in Charleston, SC. During the day he works the fields, but by night he makes baskets, and this skill is passed down from one generation to the next. Raven’s text masterfully frames several hundred years of African-American history within the picture-book format. Lewis’s double-page, watercolor images are poignant and perfectly matched to the text and mood. A section at the end of the book offers information about the “coil” or “Gullah” baskets, as they are known today, as well as the regions of Africa where this art form originated. This title works as both a story and informational book; consider it as a first purchase. A child today learns from her grandmother how to make a sweet grass Gullah basket, a craft that her ancestors brought with them from West Africa to South Carolina and Georgia. 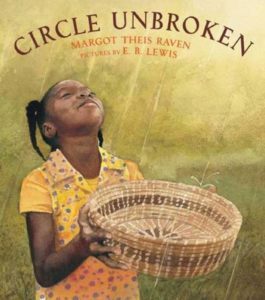 The clear poetic words and exquisite watercolor illustrations depict how the small circular basket holds the big circle of African American history “past slavery and freedom, old ways and new.” Far across the ocean, the child’s ancestor learned as a young boy to harvest tall grassy reeds and weave them into baskets to winnow the rice. The small basket serves as a beautiful way to focus the sweep of African American history, and Lewis’ astonishing pictures combine the panoramas of upheaval and war with portraits of individuals in small circles weaving and passing on their heritage in craft and story. The dramatic endpapers reinforce the strength of those ever-widening woven circles, their delicate beauty and enduring connections. A historical note and bibliography are appended. This is a great way for young and old to lean about sweet grass basket making! Perfect for late elementary school students. This book was very nice: lovely pictures, gentle storyline that was also informative. I enjoyed it very much. The book’s illustrations were very interesting and creative. The story line was an accurate dipiction of slavery and the history behind it. It connected strong family ties from generation to generation with the beautiful basket weaves and family customs. Those who are associated with the geography of the book can make a strong personal connection to the atmosphere of the book. For teaching purposes, it relates the importance of family history and bonds throught the generations. It also shows how far we’ve developed as a society. It would be part of our text set for slavery in our classroom. If I were making a very short list of books to remember Charleston by, this would be on it. The language is lyrical and wonderful to read aloud. The illustrations are gorgeous. Both Raven and Lewis do a superb job of sharing the meaning of family ties across generations, as well as sharing the Gullah culture. I’m a newcomer to the Low Country, and I don’t have any African heritage, but still, something in this story really resonated with me. Highly recommended! We love the South Carolina Low Country, and are proud to own a number of sweetgrass baskets, most made by the same lady. This book was a wonderful find to share with my daughter, who is almost 4. The pictures are lovely, and the history is honest without being too brutal for younger listeners. Older readers will certainly get the depth of the slave history, while it serves as a good introduction for the younger. I found it to be a poetic and lyrical read, and a good explanation of how the art of Low Country coil basket weaving (also known as Charleston sweetgrass basket weaving) has been passed down. Margot was an author and fine art painter. All rights reserved.